For detailed jury information and jury application, click below! 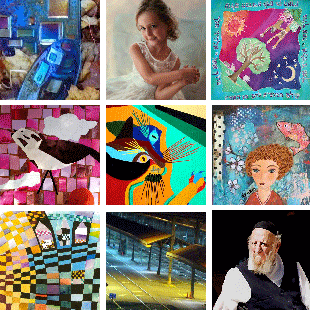 We are a group of Jewish artists in Portland, Oregon, networking and creating our own exhibition opportunities. Our media include collage, paint, silk, fused glass, fiber, precious met als, ceramics, beadwork, photography, and more. As a collective, we not only have created opportunities to exhibit members’ works of art, we also support each other’s artistic development.